“Quit smoking…” It’s definitely easier said than done. For the LGBT community, it is a bigger issue to tackle than many think, especially due to the prevalence of cigarette smoking among LGBT individuals who make up 26.6% of the smoking population as of 2013. But to really assess this epidemic and hopefully put an end to it, it’s critical to understand why this epidemic even exists – why smoking is more common among the LGBT community than their straight counterparts. See, everyone has their own reason for smoking and it varies across the board, but a common influencer is the social scene, a hub for LGBT smokers who bond over slow-burning American Spirits. It just may be the starting place for understanding this widespread habit and a place to begin rebuilding a healthy community. Travis Anderson, a 21-year-old student at The University of Texas, sums it up quite simply: among youth, smoking cigarettes is a way to meet new people and specifically for LGBT youth, “a way to break down the social barrier.” The “barrier” he speaks of is being gay, a social disconnect he claims many encounter when trying to spark up a conversation with strangers. “You can always [break the barrier] by asking for a cigarette or a light,” and this, according to Travis, is a way to invite others to get to know him beyond his sexuality, stereotypes and preconceived judgements. Anderson says it’s a strategy his straight counterparts don’t have to use as often as the LGBT community. Smoking was not always Travis’ solution to social awkwardness. As a child, smoking was an absolute no-no. “I was raised in a household where smoking was not okay,” he declares. Still to this day, Travis tries to uphold those views. Not only does his mother and grandmother not approve, but Travis says he also doesn’t fully approve of the habit. For Travis, addictive behavior, the smell of cigarettes and their ridiculous cost keep him grounded in those values – but again, to an extent. He first experienced smoking his senior year in high school, the first day of Thanksgiving break with a friend, known in the neighborhood to have a “bad boy” reputation. While not peer pressured into smoking, Travis believes the chances of becoming a smoker can definitely stem from “who you hang with.” Travis says he sometimes likes to join friends for a smoke to keep them company or to have stimulating conversation with friends. “A good conversation can last while the cigarette burns,” he says. So is smoking among LGBT youth almost purely circumstantial and social? According to Travis, that is the case, and he even goes as far as pinpointing what he thinks is the root of it all – bars and clubs, a scene where, especially in a college town like Austin, business is booming thanks to college students, young professionals and of course, young LGBT adults who enjoy going out. He believes, “on the social scene, smoking is permissible,” and limits himself to a special rule that would deem him a self-described “occasional routine smoker.” The rule has been uttered by many young smokers: if I drink, I can smoke. But the problem with that rule is pretty obvious. For Travis, it became clear that the more he went out, the more he smoked, leading him to routinely smoking more than he’s ever been comfortable with. The more he drank, the more he’d find himself outside on bar patios “getting to know,” folks exclusively by how they smoked, what cigarettes they smoked, what they talked about while the cigarette burned and even how they hold their cigarettes. To Travis, it’s almost like a math equation, a way to figure people out and just as mentioned earlier, a way for others to figure him out as well. In a perfect world, solutions to this epidemic would be written on every wall in downtown Austin, but there’s never a perfect solution, especially when LGBT smokers, high risk smokers, are specifically targeted in smoking campaigns. The battle to minimize smoking among the LGBT community is a push-and-pull one. While we aim to stop it in our community, cigarette companies continue to market to the high risk population. But Travis believes the answer to eliminating the risks for LGBT smokers can be found right where the risks live – in the bars and clubs. 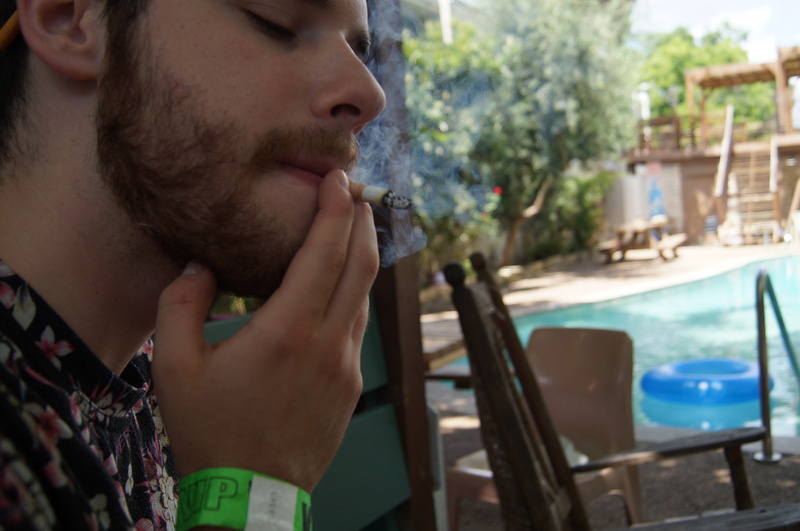 One of the main things that push Travis to venturing outside to patios for a breath of fresh air and a cigarette or to have good conversation in the social setting is the loud, throbbing music that shakes the walls in many clubs in downtown Austin. Unlike Austin, Travis asserts that Dallas has a better handle on the smoking epidemic without even knowing it. In Dallas’ gay bars, you find a lot less patrons wandering the patios, mainly because the bars are generous in size with many places within the club to escape to for a breather. Travis’ says in Dallas, he’s free to move on to a quiet lounge in the nightclub if he wants to have a conversation without screaming over music. On the contrary, in Austin, he’s forced to go outside, where there’s a greater chance he’ll indulge in a cigarette or two. He believes that if Austin had more clubs and bars with lounge areas, or quieter sections, LGBT people may be more likely to stay inside and socialize, versus outside where they are more likely to have a cigarette. It may not be an alternative that Austin can instantly implement, but definitely one to consider in the future. As for Travis quitting on his own without any help from efforts made by Austin nightclubs and bars, Travis admits that he thinks cigarettes will always be a constant in his life. 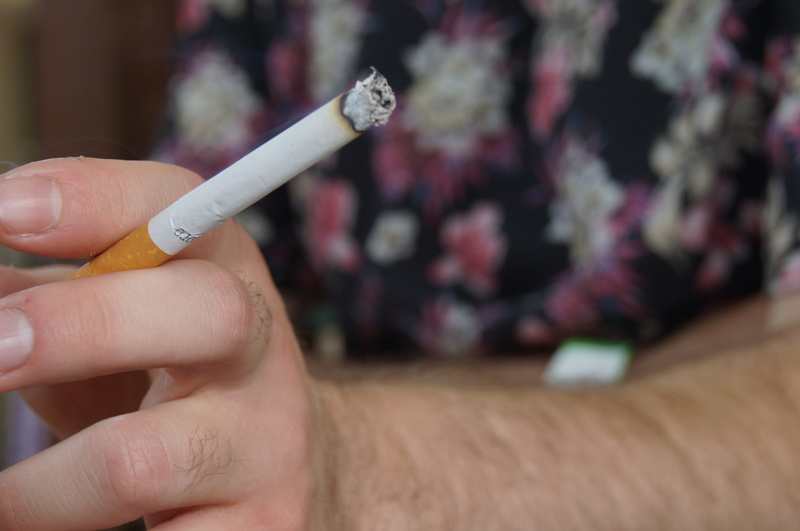 Having had an off-and-on relationship with cigarettes, he thinks it’s something he will always crave every once in awhile without developing addictive tendencies. He upholds that even though “it’s not talked about or glamorized,” smoking is something seen as “special” to the LGBT social scene. He stands by his claim that smoking remains a way for LGBT individuals to let their guards down, a way to help others see past their sexuality, although he hopes this changes over time. For Travis and many others, smoking is more than the act itself, but the social benefits that come with it. However, it’s important to send out a stronger message – that there are many alternatives to breaking that social barrier. Social smoking may seem to have its benefits, but it’s risks continue to dismantle the community, one smoker at a time. Lung cancer, heart disease, bronchitis and more smoking-related diseases constantly threaten our LGBT community and it is up to us to raise awareness. Whether it be social or for enjoyment, smoking comes with risks that can be irreversible, so while quitting is easier said than done, it’s worth it to save a young, LGBT life. This is the first in a three part series exploring smoking in the LGBT Community. For more information and statistics surrounding smoking including resources to help smokers quit, please visit yesquit.org.